Ever experienced that really good feeling where one is immersed in dreamland where everyone is happy and merry? 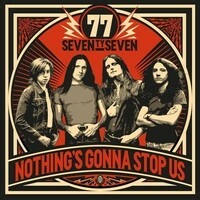 This particular feeling can be created if one listens to 77’s latest album “Nothing’s Gonna Stop Us”, those who grew up in the 70s or lovers of this particular decade will enjoy a blast from the past with this happy go lucky record. 77 were founded by the Valeta Brothers in sunny Barcelona, Spain. The name 77 in their words reflects an ideology and musical concept of the 70s, an environment they artistically feel way more comfortable to live in. Their playing style brings forth the pure and genuine passion for that great era. The moment the listener presses play they are transported back in time to the golden era of Heavy Music; legends such as LED ZEPPELIN, BLACK SABBATH, DAVID BOWIE and PINK FLOYD were entering the airwaves. This album gives the listener wonderful vibes from tracks that could easily be anthems in the world of Classic Rock. This album shows that less is definitely more, it’s nice to enjoy a simple Rock record with no hidden meanings other than to have a great time and party. The title track, “No One Like You” and “Tightrope” are just a few examples of this logic. The production behind this album seems to have given the record that vintage sound vibe that the late 60s/early 70s were very well known. It sounds as if this record is meant to be played on a vinyl player, the most vintage, retro way known to any music fan. The music itself can remind one of the no nonsense Hard Rock legends AC/DC produce and the laid back vibes that LED ZEPPELIN. If these two titans in Rock had a conceived a beautiful love child 77 would certainly be it.